Oscar trophies held by the producers and the director of 12 Years a Slave after the movie won the Oscar for Best Picture March 2, 2014. The outcry surrounding the lack of diversity at the Oscars is almost as old as the Oscars itself. Before the most recent videos of Jada Pinkett Smith and the Twitter hashtag #OscarsSoWhite, there was Sacheen Littlefeather. She spoke out about the mistreatment of Native Americans when she appeared on the Academy Awards stage, standing in for Marlon Brando after he won for The Godfather in 1973. Eddie Murphy spoke out in 1988, saying that his initial reaction was to reject being a presenter at the 60th Academy Awards because they hadn’t recognized the work of black actors. 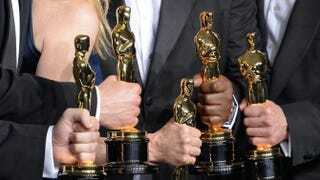 Russell Williams II, the first African American to win multiple Academy Awards in any category and an American University professor of film and media arts, says that the real problem has less to do with the work of black actors being snubbed and more to do with the voting process itself. Williams, who won Oscars for his sound work on Glory (1989) and Dances With Wolves (1990), has been and is currently a voting member of the Academy of Motion Picture Arts and Sciences. The Root: What was your take on Jada Pinkett Smith’s request for black actors to boycott the Oscars? Russell Williams: There is definitely a history of individuals in their acceptance speeches either declining their awards or saying something about lack of diversity during the speech. George C. Scott was the first to decline his Oscar in 1971 based on his critique of the voting process. I think I remember there was this screenwriter, Paddy Chayefsky, who made a politically charged acceptance speech when he won for The Network. There have been a lot more. When it comes down to the nominations, as a voting member I can understand where Jada Pinkett Smith is coming from, saying that I want you to know that you ignored one of Will’s most compelling performances, but it has happened to white actors. Tom Hanks was excellent in Captain Phillips; that was his best role since Saving Private Ryan, and he didn’t even get nominated. I have no problem with calling attention to the fact that the academy is biased. The same rules that have kept people of color and women and other ethnicities out of the academy has kept many white people who wanted to be in the academy out. TR: What are those rules? RW: You have to be nominated for an Oscar, even though you don’t have to necessarily win. Each branch [of the film categories has] different criteria. For the editing branch, a nomination is good, but we may want to see that you’ve had four films as an editor. In sound, I think they wanted eight or 10 years of experience, even though I was nominated in one. I was like, “What do you mean, you have to check my credentials?” I asked if that was a black rule. TR: How do you know if that’s something that’s uniform? RW: On the membership for each branch, all of the criteria is spelled out. I think, relatively speaking, the acting branch is easiest to get invited into because if you get nominated, generally that’s enough. Quvenzhané Wallis was invited after Beasts of the Southern Wild. She doesn’t have to necessarily accept the invitation. They usually announce the people that are invited. One hundred thousand people have SAG [Screen Actors Guild] membership, but only 2,800 or so are in the acting branch of the academy. Look at how few people who play golf are in the PGA. TR: What does membership offer? RW: It was a thank-you and a validation for the sacrifices I had made. I worked on a movie that had actually been nominated; then, lo and behold, I actually won. For me, I was living in L.A. at the time, so it was much easier for me to serve on some of the committees. My committee was the foreign-language committee. Each committee group may see 60 films; then the best of that group are matched with the best of the other groups. Then they will tally who got the largest votes. TR: What is the voting process like? RW: The voting process is simple if you don’t mind 17 different branches and only being able to nominate within their category. I’m a member of the academy, but I can only nominate for sound. That is the branch I belong to. Once the nominations are released, we can vote for any of the people, regardless of the category. When Selma came out, it would have been much harder for Ava DuVernay to get a nomination from the directing branch. For her year, that would have been 87 years in the academy where only four women had received the nomination from the directing branch, and that only one was Kathryn Bigelow, who actually won the Oscar. I think that branch needs to be scrubbed and looked at very carefully because there have been so many great films that women have directed. But why it wasn’t a snub in total, as people were saying, is because the entire membership can cast a vote for Best Picture, [and] the rest of the membership is not in that elitist directing branch. The rest of the academy thought the movie was good enough to be considered Best Picture. If you don’t know that, it looks like a snub.